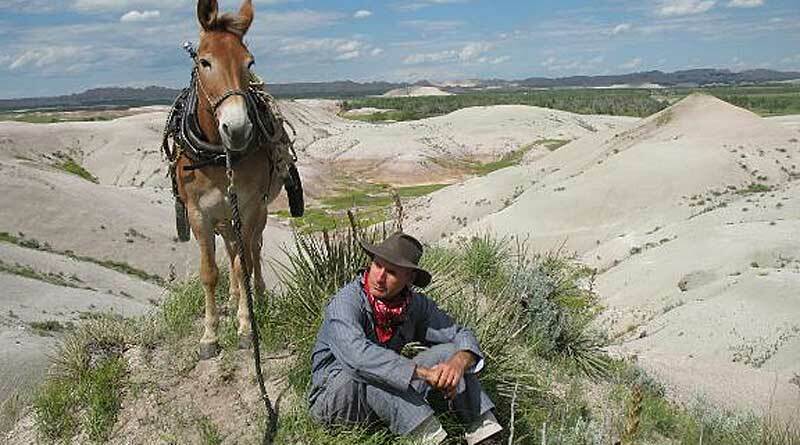 Long Rider Bernie Harberts and his mule Polly have completed a remarkable 2,500-mile journey that provided meaningful insights into what the American heartland has come to represent. The American states Harberts travelled through have traditionally been associated with hardy pioneers and resilient ranchers. Yet he discovered that large portions of the interior of the US are becoming increasingly depopulated. He filmed a house buried by tumbleweeds. He witnessed small towns dying. He spoke to lonely survivors. And he documented how the country’s most vital water supply, the Ogallala Aquifer, is being emptied by aggressive industrial-sized agricultural practices that are draining away the nation’s underground water at an alarming rate. Harberts is no stranger to adventure. After sailing around the world alone, he embarked on his “ocean to ocean” ride across the US. Bernie Harberts and his mule Polly journeyed through the US interior. Then, he set out on a remarkable journey by mule and wagon in search of the “lost sea” that once covered America’s Great Plains. What he found in this journey through the interior was a nation awash with contradictory beliefs, a people longing for emotional stability, and an environment facing catastrophic changes. He has chronicled the journey in a four-part documentary film. The film relates how Harberts travelled 2500 miles alone in a tiny wagon from Neptune, Saskatchewan, to Fort Hancock, Texas. But this story is about a lot more than a man, a mule and a wagon. Hollywood typically depicts the “Old West” as being populated by buffalo and long horn cattle. Yet Harberts met various people, including a paleontologist, a rancher and a Native American who showed him dinosaur fossils they had discovered in different states where the Lost Sea had once been. On a superficial level it’s easy to sit back, watch the pretty landscape, enjoy seeing the antics of Polly the mule, wonder at the colourful people he meets and take in the sights second hand. What sets his story apart from the vast majority of equestrian travel tales is its maturity − the important emotional, social, cultural, religious, political and spiritual threads interwoven into the tale. The landscape may still be magnificent but what this film also shows is the shocking de-population of the interior of America. During a Question & Answer interview with the Long Riders’ Guild founder, CuChullaine O’Reilly, Harberts discusses his journey, the film he made single-handed, and the unexpected discoveries made along the way. What is revealed is the story of a man who represents the ideals that once defined America around the world: principles not profits, integrity not ego, truth not deception, personal courage not ethical cowardice. You grew up riding as a child and later became a steeplechase jockey. In 2003 you rode Woody the mule 3,500 miles from Oriental, North Carolina to San Diego, California. Most people cling to the comforts of home. But you have been repeatedly lured away from a routine existence. How do you explain your love of wanderlust? My wanderlust streak was thick and wide from the get go, my motto “Go with what you have.” Age 4, I “ran away” from home stark naked except for a pair of rubber boots on my tiny feet. Already at that age, I found it more important to scratch the travel itch than wait until all the details – like clothing – where ironed out. Both my parents, especially my dad, were supportive of my rambling. I’d say my wanderlust straddles that nature/nurture line fairly evenly. Wandering just runs deep with me. Almost 50 years later, I still heed the run-away call … just a little better dressed. Billions of humans are subjected to a relentless daily barrage of technology. They are addicted to Facebook, are emotionally dependent on their mobile phones and can’t imagine a world that isn’t mechanical, electrical or plastic. Yet you decided to construct a one-man wagon and set off on a journey across one of the most desolate parts of North America. How can people find the emotional courage needed to lay aside the phone, disconnect the internet, walk out of the building and follow your example? Answer: So, how to break free from this tether? The answer is two-fold. You have to: 1) Understand where you stand on the Internet Addiction Scale, and 2) Be very organized. Bernie Harberts built the wagon that he and Polly took on their journey from north to south through the US interior. 1) Understand where you stand on the Internet Addiction Scale. Okay, so I just made up the Internet Addiction Scale. Still, the name says it all. Are you the guy at the restaurant urinal checking your smart phone while you’re peeing? Or are you my neighbor Roy who thinks he’s got enough tech if he can teach his steer to walk up his front steps? I find myself somewhere in the middle. I understand the very real benefits of technology. How that solar panel on my wagon charged all the equipment I needed to film a TV series about a mule wagon voyage across America. I appreciate how, with cell phone and internet technology, I can write to you from my cabin way up a misty western North Carolina valley. I also understand how the internet can easily slip from a useful tool to an addiction. I know how, when the whippoorwill bird greets nightfall with its haunting dusk cry, sometimes it catches me staring at food photos my friends have posted online. Yeah, that’s crazy. That’s why I’d rate myself a 5 on the Internet Addiction Scale. I don’t claim to live a 100% offline life, as though that’s some gold standard off internet. I’m like everyone else. I use the internet. I just like to know where I stand. Once you know where you stand regarding internet dependence, you’ll have a sense of how much – or little – you’ll need to wean yourself off the internet so you can tackle your Grand Adventure. If you’re that self aware, you should be able to tackle Step 2. Bernies Harbert’s wagon route from north to south. In most cases, these are just life-organization issues. As I write elsewhere, I try to make a point of leading a life small and organized enough that I can walk away from it from time to time. The way everyone organizes their life looks different but mine looks like this. I spend less than I earn. I live in a small home. I don’t have a TV or cable bill. I have a pay-as-you-go phone service. My daily driver is an 11 year old, 4 cylinder vehicle. Yes, all incredibly, yaaaaawn, boring stuff. The stuff of accountants. Thing is, I’ve spent years working to get my life shored up like this because the freedom it offers me is one of the things I value most in life. When the time comes to spin the padlock on the old home place and step away – from a weekend to a year – my life won’t crumble (though sometimes the lawn gets mighty long while I’m away). Prior to departure, you constructed a wagon designed to be pulled by one mule. Was the wagon based on your own design? How big was it and what special features did it have? Answer: The wagon was my design. I used a 1-ton Pioneer chassis as running gear and built everything else myself. I designed it to be small and light enough to be pulled by a single, 800 pound mule. It also had to be short enough that it would fit on the same trailer that I used to haul my mule. It was just over 8 feet long inside and 30 inches wide. There’s a reason my friends dubbed it the MRI machine. Empty weight (estimate) was 450 pounds. 1) Determination: yes, stick-to-it-ness is as a part as real to me as paint, axle grease and a 5 lug wheel. It’s that old spirit of “You start it, you finish it”. I swear if I build that in to my wagons or boats, it is released along the voyage when I need it most. That means once I start a project, I am more determined (or obsessed) to set it to completion. 2) Solid tires. I started out with regular tires on my wagon. After way too many flats after way too few miles, I had them filled with solid rubber. No more flats or blowouts in the hinterlands. The only downside? They are incredibly heavy. Before being filled, they weighed 20 pounds. After filling, they weighed closer to 40. 3) Solar powered. I know wagons are associated with kerosene lamps and candles. Switching to 100% solar (I carried a 100 watt panel on my wagon) allowed me to substitute LED lamps for all those heavy lamps and jugs of kerosene. All the surplus power went to charging my audio, film and computer equipment. Yes, I even charged an electric toothbrush and razor. You’ve got to keep those gums healthy on the road. The pair covered a lot of empty country. Instead of employing a horse to pull the wagon, you chose a mule named Polly. Was your decision connected to the fact that you live in North Carolina, a part of the nation where mules were used for farming, or do you have a personal affinity for mules? I just plain love mules. Unlike a man, a mule knows when to stop eating, drinking and working. Compared to a horse, a mule does more work on less food and water. They are better in the heat and live longer. They’re also incredibly hardy. Mules aren’t as easy as horses and I like that. I find it amusing mules have a reputation for being “stubborn”. But look at it this way. If you ask a person to do something dangerous (walk across poor footing, jump over something dangerous, work too hard), most people wouldn’t do it. Same goes for a mule. It’s just that because man can’t bend the mule to his will, the mule is demonized, called “stubborn.” That stubbornness is just a really well honed sense of survival. I understand mules aren’t perfect. Though great in the desert, they’re not ideal for brutally cold weather (one vulnerability being the extra large ears). They’re not safe for people that are used to buffaloing horses in to doing things. Sadly, they are sterile. Your route took you 2,500 miles from Neptune, Saskatchewan to Fort Hancock, Texas. Most people think of that area as the grass-covered Great Plains but you travelled in a wagon across “the Lost Sea.” What was this Sea? When did it exist? How big was it? Bernie Harberts and Polly in New Mexico. The Lost Sea was an ancient seaway that stretched from the Gulf of Mexico up in to Canada. 65 million years ago, it covered much of what is now the Great Plains of North America. It teemed with marine creatures including sharks, giant turtles and pteranadons. Hollywood typically depicts the “Old West” as being populated by buffalo and long horn cattle. Yet you met various people, including a palaeontologist, a rancher and a Lakota elder who showed you dinosaur fossils they had discovered in different states along your route. Is evidence of the “Ancient West” hard to find and was it populated by any special type of animal life? In historical and wildlife terms the Hollywood “Old West” was short and recent. The long horn cattle era lasted about 150 years. The era where long horn cattle and buffalo overlapped was even shorter. Even the Grassland Prairie is relatively young. The most recent North American Ice Age was only 12,000 years ago. 65 million years before that, the Great Plains were covered by an ancient sea. Traveling across the Great Plains, we came across these 65 million years of historic detritus piled one layer above the rest. Interspersed were the individuals that benefited from each chapter in this long history – Ranchers who pumped Ice Age-old water out of the Ogallala Aquifer – Seismic prospectors who crisscrossed the Plains in their white pick up trucks looking for where next to frack oil from the ancient sea bed. I found plenty of evidence of this ancient history out rambling in my wagon, from giant fossilized seashells in Kansas to an enormous, alligator like Mosasaur fossils in South Dakota. Yes, I encountered enough buffalo and long horn cattle to populate a first class Hollywood stampede scene. No, I never met any one else filming a feature film about America’s mighty Great Plains. In addition to being a Long Rider, you’ve also sailed around the world solo. These trips have required you to endure all types of harsh weather. Yet during the wagon journey you experienced what you called “the Big Alone.” Old-timers used to call this “prairie fever.” How did the emptiness of the landscape affect you emotionally and what steps did you take to overcome the problem? I didn’t have a smart phone on my wagon journey. For me, that was important. You see, I never got hooked on “checking-in” with folks. That meant I had to face the wilderness, the extremes of weather and loneliness, face on. I read books. I filmed what I found. I also relied on my imagination. Like a sailor at sea, I came up with the equivalent of a message in a bottle. I gathered up tumbleweeds, painted them orange and tied notes in to them. Then I let them loose in the empty prairie. The wind would whisk them away and I would fantasize about who would find them. And that was really powerful − wondering who might find my message. That hope, that optimism that someone out there on the plain would find my message and get back to me, was more powerful than being able to make a quick phone call to friends back home. There was no manic curiosity to check in with friends on social media, to see what they were up to. What I was missing. The point of this wagon voyage was to go to the depths of the empty American prairie heartland. Look the emptiness in the eye, deal with the discomfort, and, ultimately, come to an understanding and peace with the emptiness. Having communication to the outside world would have defeated the purpose … and made me feel even more left out. Sailing alone around the world was great training for this. Isolation is something you build up to. My first solo sail was an overnighter. Later, I would sail a few days alone. Then a few weeks. By the end of my solo circumnavigation, I was able to spend 65 days alone at sea quite comfortably. If I’d attempted that straight off the bat, it would have been a lot harder. This time alone at sea translated really well in to spending time alone on the Great Plains. With mule Polly my constant companion, I felt even less alone. The American states you travelled through have traditionally been associated with hardy pioneers, resilient ranchers and enduring farmers. Yet you discovered that large portions of the interior of the USA are becoming increasingly depopulated. You saw a house buried by tumbleweeds. You had to write your own “Welcome to Oklahoma” sign when you entered that state. You discovered that small towns are dying, and the country’s most vital water supply, the Ogallala Aquifer, is being emptied by aggressive industrial-sized agricultural practices that are draining away the underground water. The editor of a small Kansas newspaper asked you, “Will the water run out before the population runs out?” Are we witnessing the de-population of the interior of America? Here’s the thing that puts this in to context. Until the late 1800s, the Great Plains region was called the Great American desert. Until Europeans showed up, aside from the Native American tribes that lived there, the Great Plains were largely empty of humans. Then, during Frontier Days, thanks to westward expansion and the Land Rush, the population density surged to 2 people per square mile. 100 years later, traveling across the region with a mule and wagon, I came across the architectural bones of what was left. I found old homesteads, or just the remains of them, in the chalk beds of Kansas. I walked through beautiful abandoned stone homes in eastern Colorado. I walked along dried up irrigation canals in New Mexico. Today, just over a century after the homesteading rush ended, the population has gone back to 1.5 people per square mile. It won’t return to zero for a long time. But when it does, it’ll simply going back to the historical (in millions of years terms) mean. Thing is, farming and, to a certain extent ranching, have always been labor intensive. When the Great Plains were first settled, farmers relied on horses and men to break the prairie and tend the crops. Farms were small. Communities sprang up across the Great Plains. Every community was a wagon’s trip away from the next. So you had a lot of small towns checker-boarding the prairie. Over time, technological advances meant fewer people were needed to tend the land. Tractors replaced horses. As fewer people were needed, communities started disappearing. Over the years, agricultural equipment has become increasingly powerful and automated. The latest development are the so called “self driving” tractors that rely on machine learning to navigate the fields. All these communities were built on the Great Plains back when lots of human labor was needed. That means they’re full of homes and stores and schools and movie theatres that once catered to the men and women that worked the fields. Now that so much less labor is needed to tend the fields, people have moved away from the communities, leaving all these empty houses behind. Many of the towns are starting to look like ghost towns. At first I found it incredibly depressing. After a while, though, I started to understand that these towns were actually incredibly recent additions to this stunning prairie landscape. They were like groups of square white flowers that sprouted on the plains. Now they have finished blooming and are fading away. In the New Mexico desert you found an abandoned farm house. Most people would have been intimidated by being alone in such a barren landscape. Yet you set up camp, put up an awning to protect Polly from the sun and then placed your journey and your life into perspective. You said, “We had everything we needed: food, a bit of shade and water. My life had this extraordinary clarity about it.” Consumerist society urges people to accumulate more and more things. Did being in tune with Nature confirm that the more you know, the less you need? I’ve tried to set up my life that way. I’m a normal person. I’m not usually traveling across America with a mule. Like all business owners, I spend most Mondays to Fridays working 9 to 5 in front of my computer and on the phone. Evenings, Julia (my girlfriend) and I may split firewood, tend the garden or walk up to the orchard. But that’s the idealized version of my life. Our lives have too much stuff in them. Physical stuff and to-do stuff. Even though we live simply in a remote part of western North Carolina – in a 400 square foot cabin heated with wood – we, too, get sucked in to the busy-ness of life. We drive to the store for milk. We drop by the hardware store for rope. So how do I deal with this? I try to lead a life that doesn’t need me to run it. This looks different for each individual. For me, it means a small home, simple lifestyle and spending less than I earn. That means every few years, when the travel itch needs scratching, I can put my affairs in order, build a tiny wagon (or saddle a mule), spin the padlock on my home and hit the road. “The more you know the less you need.” It helps prune the day to day. It helps enable the Big Getaway. After you and Polly reached the Rio Grande River, at the border between Texas and the USA, you observed, “I set off looking for one thing, the Lost Sea, but instead found lots of other things.” What did you discover about the American people? One popular cliché views Americans as such: they are as non-functional as their Washington DC politics and as shallow as their reality TV programming. Sure, you’ll find those types in America. But you’ll find them in every other nation as well. Thing is, for 14 months, my mule Polly and I relied on everyday Americans to help us get across America. We travelled in a tiny wagon. We didn’t carry many provisions. We were vulnerable to weather, heat, season and the physical limitations imposed by muscle powered (as opposed to piston powered) travel. We met Americans of all stripes – tattooed, bald, long hair and normal. We met ultra-religious types and atheists, ranchers who controlled prairie dogs with bullets and those who preferred ferrets. We met Republicans and Democrats and folks that voted both ways. But all these folks shared one thing in common. When mule Polly and I needed them, people of all shades and stripes stepped forward. They may have disagreed among each other about politics and religion and water rights, but when a vulnerable stranger with his mule entered their lives, they stepped up to help. That, I discovered, was an incredible measure of a land. The Lost Sea Expedition resulted in the creation of a four-part documentary. Where can people view it? The Lost Sea Expedition series will premier on Rocky Mountain PBS (Colorado) in late 2017 or early 2018. The next step is to make the series available for National Public Television distribution. The series will be available online and on DVD as broadcast agreements are reached. Full distribution updates can be found on LostSeaExpedition.com. To learn more about wagon travel, read The Wagon Travel Handbook. All photos courtesy of Bernie Harberts. Republished courtesy of the Long Riders’ Guild. So, he learned this country is populated by great people…So refreshing after hearing all the ‘gloom and doom’ from ‘the left’….